One of the prime movers in the establishment of the Albany Equestrian Centre was Mike Stidwell. It was always Mike's dream to create a central hub for equestrian activity in Albany, involving all the local equestrian clubs, with the Albany Equestrian Centre being a 'peak' body for these clubs, and the organisation was modelled on the Sports Lottery House concept. This vision was contagious and captured the imagination of the clubs, with the Albany Equestrian Centre coming into being in early 1988. 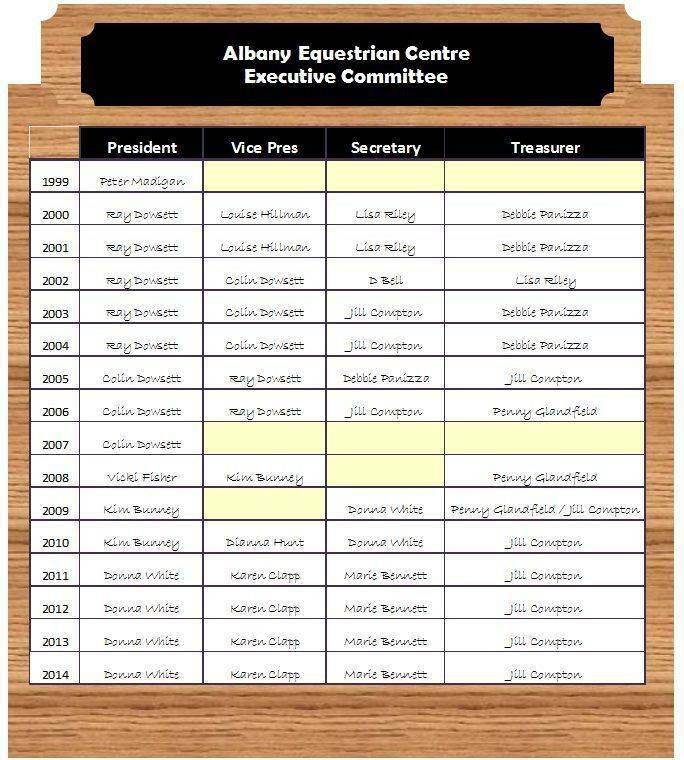 Albany Equestrian Centre Executive was made up of Peter Madigan as President, Mike Stidwell (Secretary) and Ray Dowsett (Treasurer), together with the club delegates, and this Executive remained in place, and led the development of the Albany Equestrian Centre for the next 10 plus years. Today (2016) there are five affiliated Clubs - Southern Districts Dressage Club; Albany Horseman's Association; Albany Pony Club; Albany Adult Riders Club; and Albany Natural Trailriders. The first action of the Centre was to consolidate the Centre grounds by having the then leases of the Albany Western Riding Club and the Albany Horseman's Association surrendered and included into a larger parcel of land in the name of the Centre. This area was approximately 60 hectares, and comprises areas for all facets of equestrian activity. In January 1988 both the Albany Horseman’s Association & the Albany Western Riding Club requested their lease to be terminated (surrendered) to allow a new lease be entered into with the Albany Equestrian Centre. This new lease to the Albany Equestrian Centre was then formalised, and commenced on 1 January 1990. In the main, these objectives have been achieved. The initial Constitution of the Albany Equestrian Centre was formally registered on 18 January 1989 (A08238235), with the Centre then becoming an incorporated body. The Centre was fortunate in the beginning in that it already had a building - a former Ministry of Education demountable classroom complex. in 1993, the layout of the building was modified to provide office accommodation and facilities for all user groups on a shared basis. The ablution block was constructed also constructed at the same time with the assistance of a grant obtained from the Depart of Sport & Recreation. In the early 1990s, the Albany Foreshore was being re-developed, and an opportunity was presented for the Albany Equestrian Centre to gain the Renewable Resources shed which was being demolished. This opportunity was grabbed with open arms, and Ray Pomery relocated these materials to the Centre. The main beams were subsequently used in the construction of the indoor arena. Geoff Holmes, Hobbs Smith & Holmes, Architects was commissioned to prepare a five stage concept plan, and I undertook to organise the funding to complete the first stage of the project, which is still as you see it today. Peter Madigan obtained the following funding for the project: $100,000 from the Lotteries Commission; $30,000 from the Department for Sport & Recreation; and, a $10,000 private loan (which has been subsequently repaid). The footings were laid by local builder, John McBride, and funded by a further grant gained through the efforts of Louise Hillman. And, finally the structure was completed by Koster's Albany. At the same time, the Albany Equestrian Centre was successful in attracting a Work for the Dole program, and Ray Dowsett undertook the oversight of these workers, who were primarily involved in tidying up the grounds. it was not long after the completion of the indoor project that Mike Stidwell became seriously ill, and relinquished his role of Secretary. Sadly, Mike passed away in 2000. In recognition of his efforts and contributions, and indeed his vision, the Albany Equestrian Centre Management Committee unanimously supported the motion to name the indoor arena after Mike - 'The Mike Stidwell Indoor Arena'. It was after this time that Peter Madigan stood down as President, after nearly 14 years at the helm.